Many roads are currently being repaved by WSSC and Montgomery County’s Dept. of Transportation throughout Kemp Mill. WSSC: All the repaving that WSSC is doing should be from curb to curb, after initially patching up holes in the street made during the replacement of pipes. Most, if not all, of the work now seems to be south of Lamberton. Contact Mike Ballantyne, WSSC’s on-site Construction Inspector with any questions or problems: cell: 240-508-3253, office: 301-206-7363, fax: 301-206-7963, Michael.Ballantyne@wsscwater.com. Dept. 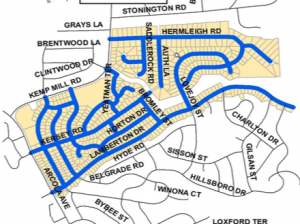 of Transportation (MCDOT) Repaving: All roads in Kemp Mill between Lamberton and Hermleigh, east of Arcola and Kemp Mill Road are being repaved this year (see blue roads on attached map). Although the County began by trying to patch up certain sections of road, and completely redo others, MCDOT made the redetermination that it was more suitable for all of the existing roads to be completely milled and resurfaced as opposed to patched, with full width/depth Hot Mix Asphalt. the work, and when it will be completed. Inspector, cell: 240-821-7133, office: 240-777-7648, nicholas.boone@montgomerycountymd.gov. DOT’s Pavement Management Section Chief is Randy Paugh, 240-777-7608, Cell: 240-821-7242, Randy.Paugh@montgomerycountymd.gov. This entry was posted in Traffic, Utilities. Bookmark the permalink.